WaterField Designs announces the Stratto, a slim, full-grain leather bifold wallet with convenient hidden slots for contactless cards so users can conveniently tap-and-go while cards remain safely inside. The Stratto is the third wallet unveiled by WaterField as part of its Wallet Month celebration, the culmination of a two-month crowdsourced design project for which the company harnessed the wisdom of over 2,000 customers to create new wallet designs. Every week in March, WaterField will unveil two additional new wallets, each handcrafted in WaterField’s San Francisco sewing studio. The new Stratto Wallet is a classic leather bifold handmade from sumptuous full-grain leather. The slim wallet is ultra-soft to the touch and conveys a traditional elegance. The Stratto holds about eight to ten cards in two interior pockets and a stash of unfolded bills. Behind the cash compartment lie two hidden slots designed for users’ contactless cards. With work ID, metro or other such cards in place, users can use the Stratto to tap-and-go while leaving these cards securely inside. The classic bifold is available with or without RFID blocking and fits comfortably into a front-pants or jacket pocket. 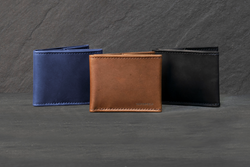 Last week, WaterField introduced two minimalist wallets to commence the company’s March Wallet Month: the Minemo, a beautiful bare-bones cash and credit card carrier available in three leather and three Italian waxed canvas (vegan) colors, and, for use as a secondary wallet or as an everyday wallet for ultra-minimalists, the Clyff Wallet, a cash and card pouch with a simple, clean design and an ultra-compact footprint. WaterField’s forthcoming new wallet pairs each center around a different theme — week #1: wallets for minimalists, this week: wallets for classic carriers, week #3: wallets for specialized items and uses, and week #4: fresh upgrades to existing WaterField wallet favorites. Although customer suggestions have always inspired new WaterField products, the company initially formalized its unique community-sourced design process with the development of its https://www.sfbags.com/collections/cases-for-nintendo-switch Nintendo Switch case collection and has since engaged customers in the development of the Air Porter Carry-on, the iPhone Camera Bag, the Pro Executive Backpack, and a series of Gear Cases. Price: Leather—$79; with RFID— +$10. Colors and materials: Oil-tanned. premium full-grain leather in Black, Brown, and Blue. The Minemo. Leather—$59; with RFID— +$10. Italian Waxed Canvas—$49; with RFID— +$10. 4 x 2.6 x 0.375 in; .8 oz. Oil-tanned full-grain leather in Black, Dark Brown, Blue; Italian Waxed Canvas in Stone Red, Heritage Blue, Forest Brown. The Clyff. Price: $39; 4 x 2.5 x 0.25 in; .8 oz; Oil-tanned full-grain premium leather in Black, Dark Brown, and Blue. Pre-order now. Shipping March 22, 2019. WaterField Designs is an innovative San Francisco designer and manufacturer of bags and cases for tech-savvy consumers who want to transport their technology stylishly and responsibly. WaterField manufactures custom-fitted, high-quality cases and bags for a full-range of laptop computers, smartphones, tablets, gaming devices, and other digital gear. All products are manufactured to exacting standards entirely in San Francisco. More information at "Our Story”. Software and hardware solutions for Fixed Asset, Warehouse, Transportation and Logistics, Retail, Healthcare, QR Codes.